There are very few places in Europe that have both fresh water fishing and salt-water fishing in the same place. The Delta of the Ebro River, a privileged area in the South of Europe, is an ever changing area molded by its inhabitants who have known how to conserve a rich culture intimately connected to the river, the Mediterranean Sea and rice cultivation. The location of hotel is exceptional with 400 meters of river front with direct access to the mouth of the river. BC Estudio Architects has more than 50 years of experience in project developments respectful with the environment using vernacular inspiration. It will develop the architectural project in all of its facets: city planning, architectural project, interior design and landscaping. 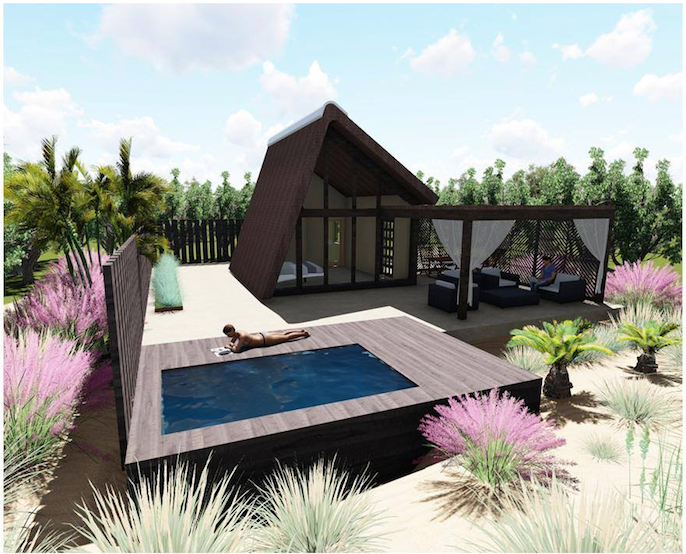 The cabañas of Lo Maset are inspired by traditional local architecture, using wood, thatched roofs and clay walls. The landscaping is an essential element of this project, mimicking the surround area of rice fields, white sand dunes and local vegetation to lend to an experience of privacy in a unique place. Without a doubt, Fishing is on of the great attractions of Lo Maset. One advantage is that fishing is an activity that may be carried out all year, promoting tourism in all seasons. The fish that may be captured include red tuna , bonito, grouper, palometa, dolphin fish, cat fish, black bass and carp. The hotel will offer the best service possible for fishing with boat service, including guides and boat hands, private docks in the river and a boat ramp. It will also have after fishing activities with a spa and a first class restaurant . It will all be in the context of slow life, contemplating and enjoying nature and the meandering of the river. We want to create a place that permits the individual visitor, a couple, a family or a business event to enjoy activities in a tranquil, private and comfortable atmosphere. We want Fishing to be one of the leit motivs of Lo Maset, a place to recover peaceful equilibrium, to feel the gentle breeze of the sea as well as the sense of adventure and the delight of fishing. Previous House Above the waves in Western Australia.